Yes, that is an alien inside it. 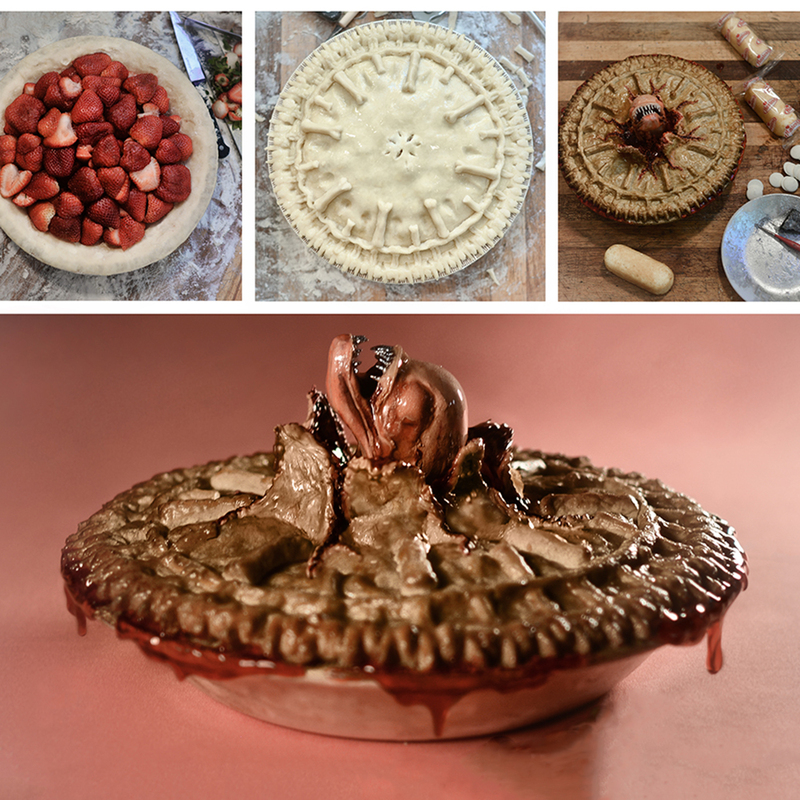 Warning: this pie is seriously creepy. To promote the release of Alien: Covenant, which opens tomorrow, baker Christine McConnell made a Chestburster pie as scary as any Xenomorph XX121 would be in real life. The pie, which was actually sponsored by 20th Century Fox, depicts Chestburster rising, teeth-first, from its center. The rupture that this parasite makes drips with strawberry filling blood, as do the edges of the pie. So try not to think about an endoparasitoid bursting violently from your chest the next time you're eating a strawberry pie. As part of the Fox sponsorship, McConnell also made a spore pod-shaped strawberry cream cake, which looks unsettlingly delicious for something with a parasitic face-hugger crawling out of it. Along those lines, she also made a face-hugger sugar cookie that's almost two feet long and totally ready to infect you. Meanwhile a chocolate devil's food cake of a fullgrown Xenomorph with cookie jaws and sugar glass teeth is absolutely horrifying. Even that's not as impressive, though, as her gingerbread recreation of the Juggernaut with incredibly realistic trees and a sugar glass lake. A photo of the cake could easily be mistaken for an actual film still. McConnell is famous for her creepy confections. You may remember her cake-ified Gremlins or her gingerbread replica of Miss Peregrine's Home, but that's just the tip of the iceberg. McConnell has made just about every horrifying baked good you can imagine, and every horrifying baked good you didn't dare allow yourself to imagine. To keep up with her blood curdling creations, you can follow @christinehmcconnell on Instagram. Just don't scroll through her feed before bed if you don't want to wake up screaming in terror in the middle of the night.